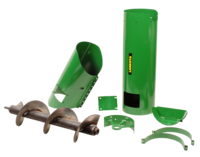 The LANAUGHURK is an unloading auger extension kit for John Deere® 60, 70, & "S" Series combines with 17" High Unloading Rage augers (HUR). The LANAUGHURK will extend the reach of your John Deere® high unload rate auger by 48". This kit mounts easily to the existing auger with nuts and bolts, and does not require any welding or drilling.